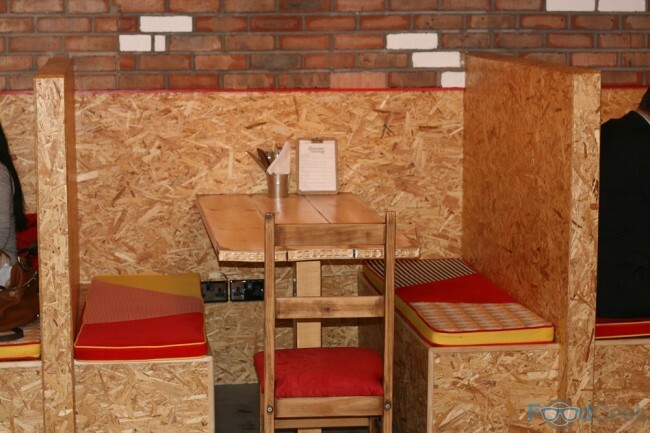 It seems hot dogs are the new burgers in Manchester with several new places offering ‘dirty’ or ‘gourmet’ versions of the humble street food. 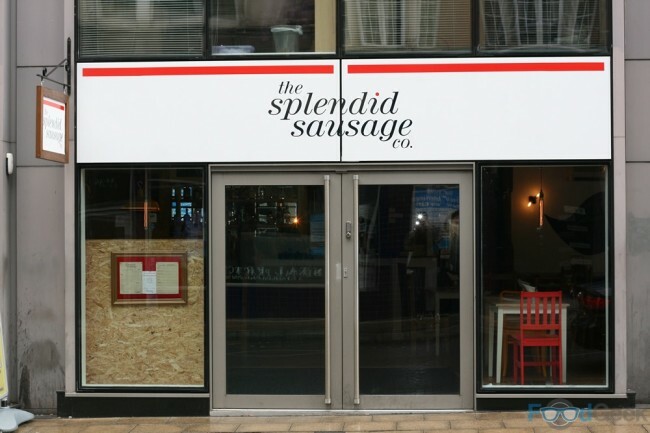 The latest being ‘The Splendid Sausage Company’ who recently took over the Jack Spratt site on John Dalton Street. They invited me down to have a look around and sample their sausages. I never made it to Jack Spratt but i’m told it was rather dark, it certainly isn’t anymore. I was impressed by the light and airy interior, particularly the bright wooden booths. Apparently the whole refit was completed in just 10 days too! 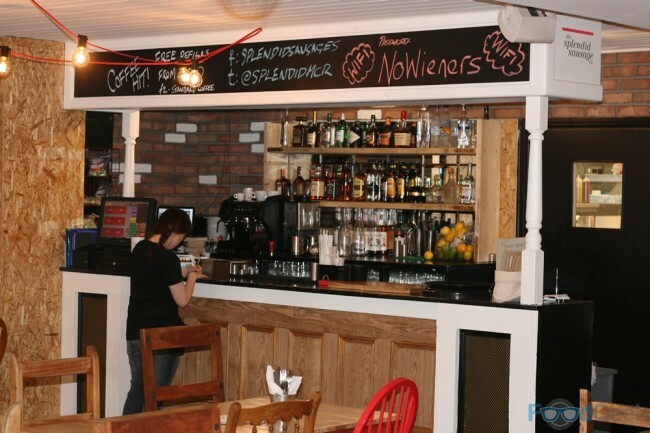 Interestingly, the word ‘hot dog’ isn’t mentioned anywhere on the menu but there is plenty of talk of ‘no wieners’. Whilst I applaud the decision to use quality sausages which are produced by an award winning local butcher, if i’m served a sausage in a brioche bun i’m going to call it a hot dog. There are 8 types of sausage available, most made with pork including; ‘the spanish’ (pork, sun-dried tomatoes and peppers), ‘toulouse’ (pork, bacon, red wine & garlic), and ‘the welsh’ (pork, ginger, coriander, leek, & chilli). Alternatively there’s ‘beef’, ‘moroccan lamb’ and ‘the veggie’. I must confess i’m not really a fan of the recent trend for overloaded hot dogs, for me if you can’t pick it up to eat there’s not much point it being in a bun. I considered ordering a simple sausage topped with just onions and sauce but in the interests of this post I instead went for one of their ‘Combos’, custom built combinations of sausages and toppings ‘piled high’. 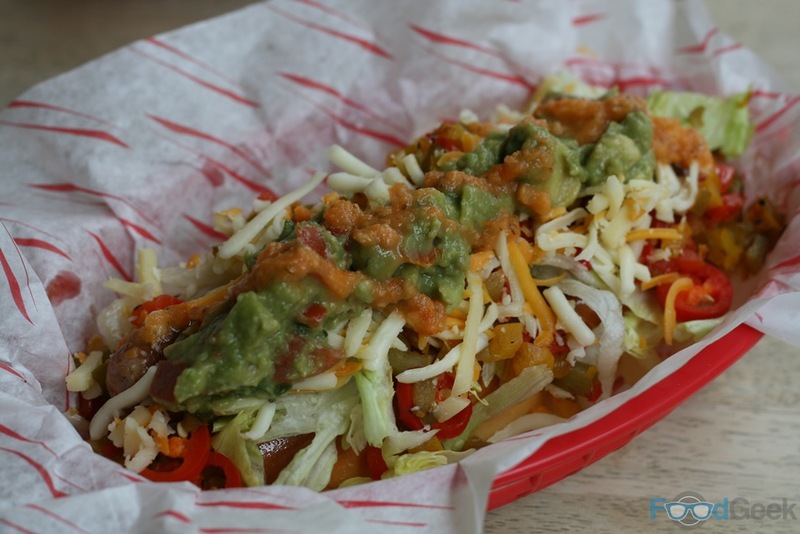 My ‘Mexican’ certainly was that; under the mound of three cheeses, peppers, lettuce, chillies, guacamole and hot sauce was a ‘spanish sausage’, somewhere. I found it eventually, tried it by itself and was seriously impressed with it’s quality. It tasted great and had a fantastic meaty texture, nothing like the cheap sausages usually found in hot dogs. 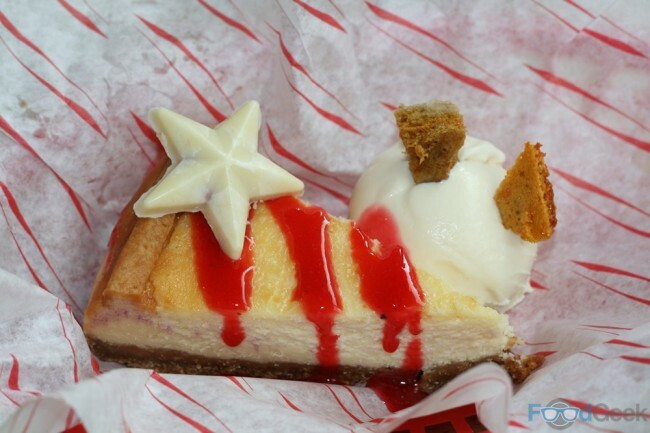 Despite my reservations I really enjoyed it with the toppings too, I even managed to pick it up and eat most of it without a knife and fork. 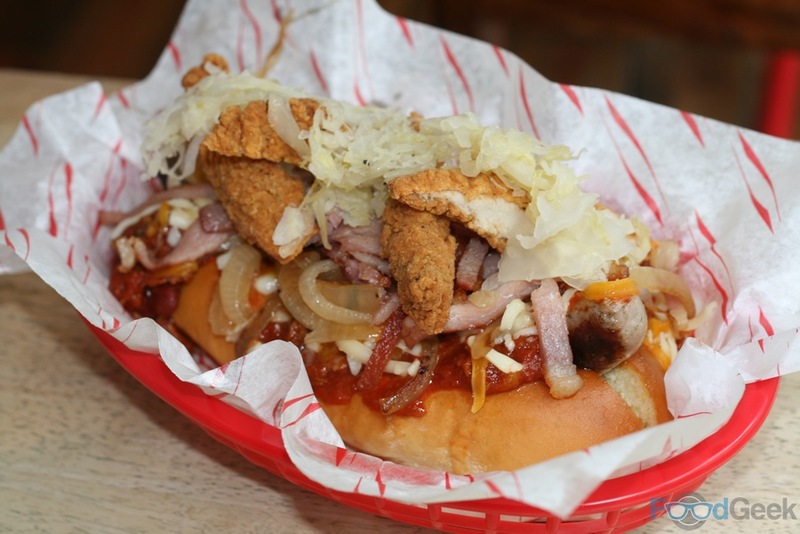 It was impossible to eat Mrs FG’s ‘J.Y.D’ by hand though as it was piled even higher with breaded chicken, chilli, bacon, fried onions, sauerkraut and cheese. 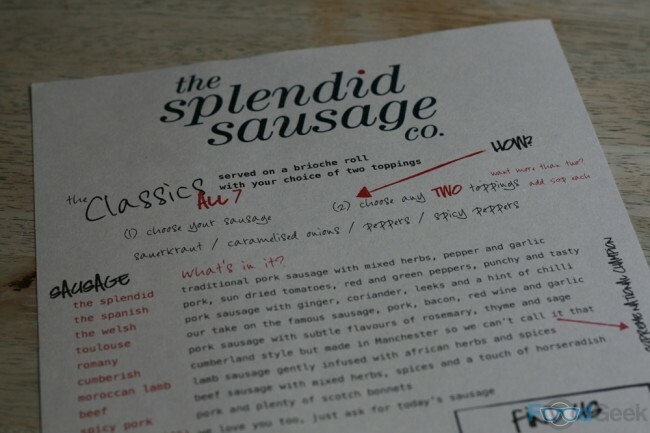 Again the quality of the ‘splendid sausage’ (traditional pork sausage with mixed herbs, pepper and garlic) was excellent; it tasted good by itself and though the toppings are slightly ridiculous they are delicious and a lot of fun to eat. 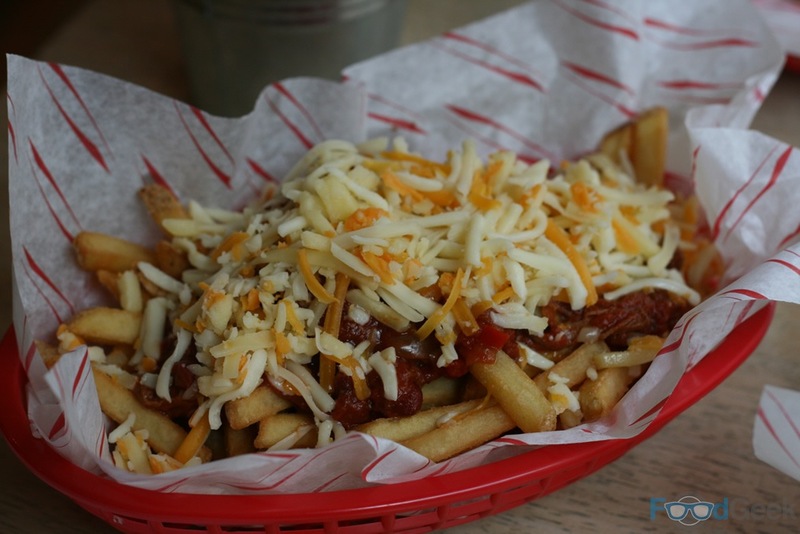 A side of ‘Chilli Cheese Fries’ was equally tasty, ‘dirty’ and very addictive. 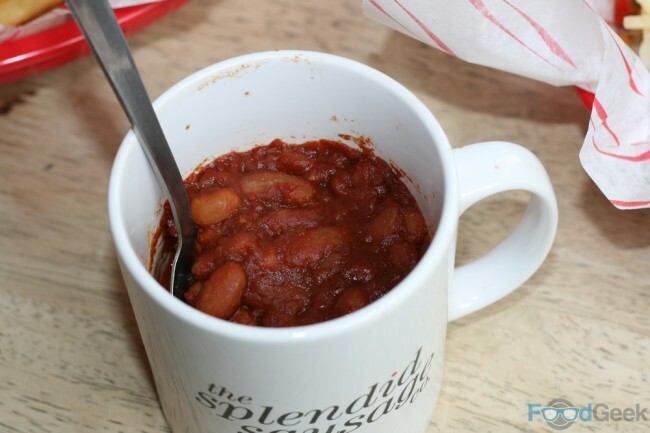 I loved the sound of the ‘Cola Baked Beans’ but felt they were well under seasoned. A shame as otherwise they’d have been brilliant, I really liked the generous chunks of sausage they contained though. I enjoyed sampling the range of sauces and was pleased to hear that they’re all made in house. 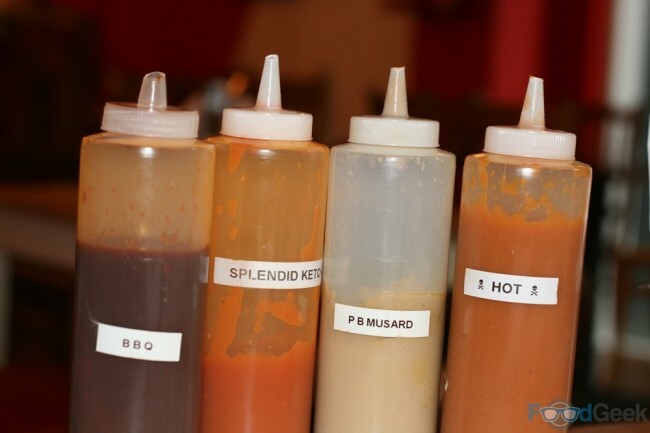 The hot sauce was my favourite, Mrs FG loved the ‘Peanut Butter Mustard’, a fascinating combination which came about by accident but really works well. 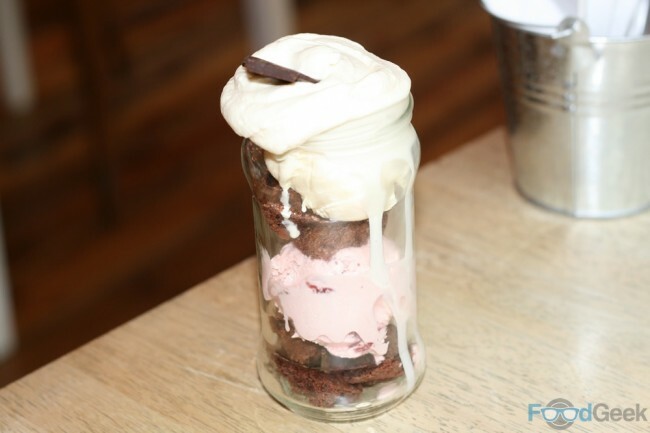 Desserts, are simple but highly enjoyable; a baked cheesecake and a lovely sundae which despite being served in a jam jar, which I found rather inconvenient was indulgent and delicious. There’s an excellent selection of beers including my current favourite Long Hammer IPA and a couple of good ones from Anchor, owner Emily says they’re planning to stock more local beers from nearby mirco-breweries too. 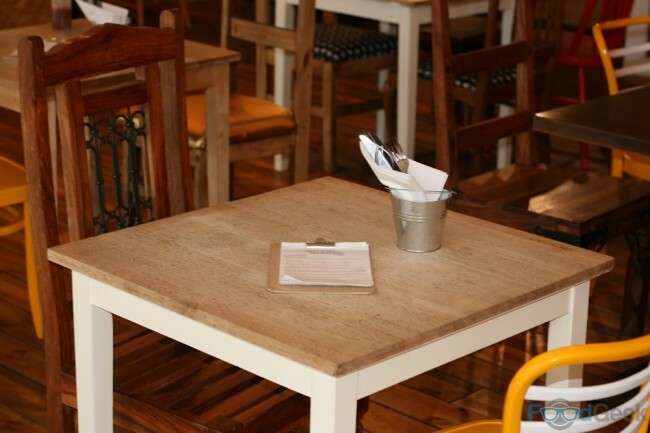 The cocktail menu looks fantastic as well. 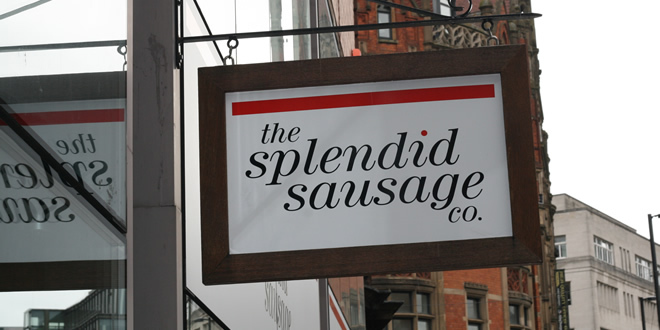 Overall I found The Splendid Sausage Company to be a really fun place. They’re not trying to be anything they’re not but what they are, they’re doing very well. Disclaimer: I was invited to The Splendid Sausage Company to sample the dishes and as such not asked to pay. Like usual this does not guarantee a write up, let alone a positive one. All views are my own honest opinions.